Regulations, compliance, identity verification, bank partnership, machine learning the list goes on. In fintech, there’s a growing list of obstacles to consider when developing your financial product. Wouldn’t it be nice if you could peer into the mind of someone who’s sole goal was to solve these issues? You can. On our latest Currencycloud Podcast, we spoke with Sankaet Pathak, CEO and Founder of SynapseFI. His company is designed as a one-stop shop, integrated banking platform that handles a growing list of issues for any fintech company developing a financial product. Identity verification, compliance, account creation, etc. These aren’t just theoretical issues to Sankaet — as an immigrant, he couldn’t physically open a bank account; he has firsthand experience of the multitude of issues surrounding the financial industry, and has developed a comprehensive platform to solve them. When Sankaet first came to America, he faced a mountainous problem: He couldn’t open a bank account. With no Social Security number, opening a bank account was simply impossible. Even after obtaining a SSN, he still couldn’t open an account online. Sankaet had to physically walk into a bank with a list of proofs for his identity, address, etc. In today’s technology-driven world, physically marching into a bank with printouts of his income and utility bills seemed highly manual and inefficient. This problem became his opportunity. Sankaet’s growing company now handles these account creation issues, as well as, compliance services, bank partnerships, fund settlement, account aggregation, risk mitigation and others. With a growing list of customers north of 150 fintech clients, Sankaet’s knowledge on the industry is profound. Fintech companies attempting to provide a financial service will need a partner bank to work with. This process of finding the right bank to partner with can take months, sometimes years, considering all the technical pieces and regulatory issues. Many fintech companies are heavy on the engineering side of the issues. But the regulatory? This gets foggy pretty quickly. The regulatory landscape is vast, varies between regions, and is ever changing. While the technical side is often understood by companies, they usually have very little expertise of how to implement their product and stay in compliance with governmental and other regulatory agencies. Why are banks behind in AI/ machine learning? Why aren’t traditional banks providing the AI to take care of these pain points? When we consider the technology-driven, fast-paced environment we all operate in, it seems these are obvious problems that a longstanding brick-and-mortar could handle. Why are banks behind in the AI field providing these services, culminating in the scenario above, where Sankaet had to physically walk into a bank with a stack of paperwork to provide verification? Most of the regulations are fairly new to banks. We tend to think of all these as long standing protocols. However, many of them, especially within the US, were developed after 9/11. Bank executives are not software proficient. The individuals making many of the decision on how account creation and other issues are solved aren’t necessarily software gurus. Budgetary issues. The way budgets are assigned by year, banks aren’t allocating appropriate funds to implement automation. So, the same issues are prolonged year to year. So with banks behind on these complexities, how is a company like Synapse handling these issues? Let’s take account creation for instance. Sankaet had to go into a bank branch and provide documentation of his identity, address, and income. Sankaet says that essentially, with AI, we can now go old school, and make individualized, non-centralized decisions. However, instead of having to have someone physically come into a branch with a utility bill, a company can use machine learning and computer vision to inspect these documents and create an automated decisions. Years ago, this wasn’t a possibility. “Computer vision just wasn’t as good two years ago as it is now,” he said. But now? AI can take the documents and underwrite and create an account without the individual ever having to set foot into a bank. We can have machine learning do what people used to do inside banks — machines can do lip reading, underwrite for the individual based on real-time income verification. What’s next: unnecessary centralized systems. Sanket says that we simply don’t need a centralized identity verification system anymore. The whole reason that we had a centralized identity verification system was because we use a number, such as a credit score, that ten other companies have relied upon to make an evaluation of a potential customer’s situation. A centralized scoring method that others are relying upon seemed more efficient than re-computing and reworking underwriting every time for the individual. But now the cost of AI is so low, you actually can rewrite everything every time as opposed to relying on a centralized identify database link a credit score. This post is based on a Currencycloud podcast with Sankaet Pathak. 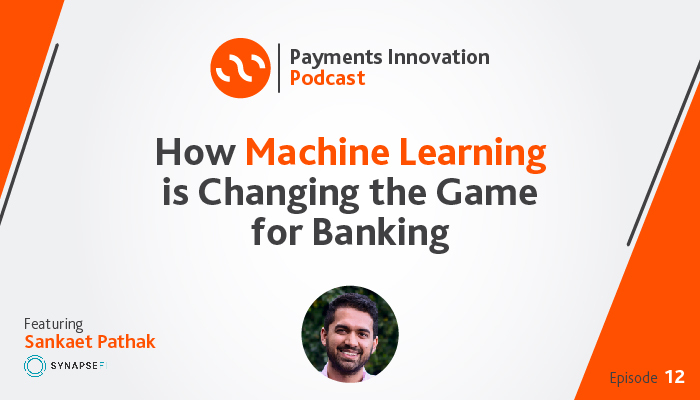 To hear this episode, and many more like it, you can subscribe to Payments Innovation podcast here. If you don’t use iTunes, you can listen t all the episodes here.